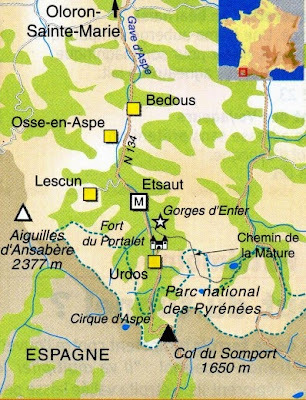 Bedous is located in the Pyrénées-Atlantiques in the region of Aquitaine. The village is part of the township of Accous which is part of the district of Oloron-Sainte-Marie. The closest airport to Bedous is Pau Airport (44 km) also worth considering are Lourdes Airport (53 km), Biarritz Airport (91 km), or Toulouse Airport (173 km). 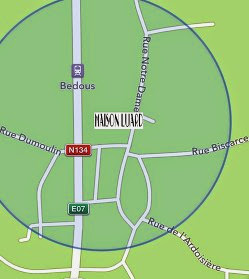 Bedous is 24km approx 30min from Oloron St Marie and can be easily navigated along the N134. LITTLE KNOWN FACT - Bedous is the birthplace of Pierre Laclede, founder of the city of St. Louis, Missouri. The home has stayed in the family since the 1700s.